Coupon Description: Get $7 Off this stainless steel mini keg growler with More Beer promo code BEERDEAL. This Stainless Steel Man Can mini keg growler holds 64 oz of your favorite beer or home brew! This awesome little mini-keg will keep your beers fresh, carbonated and safe in its durable stainless steel body. This beer growler is built from food grade 304 stainless steel and the unique threaded lid removes for easy filling and cleaning. ManCan growlers are fantastic because the have an optional tapping systems that will thread in for a true keg like experience. These stainless steel keg style growlers make an awesome gift for any home brewer or beer lover! Coupon Description: Williams Brewing currently has a promotion going on that will save yo 15% on your order of Cryo Hops when you purchase 8 packs or more. If you love beer with a hop forward taste, you should try these cryo hops! These hop powder pellets from Cryo Hops are a new concentrated natural hop product that imparts twice, thats right, 2x the hop aroma of standard pellet hops for the same weight. This means LupuLN2 is ideal for late hop additions to build up hop aroma and character in IPA and Pale Ale beer styles. It reduces hop fiber material in the wort, allowing a brewer to pack even more hop flavor and aroma in to an IPA without losing as much wort to hop pellet absorption. LupuLN2 also tends to reduce the ‘grassy’ effect a large amount of normal strength hop pellets can have on a strong IPA when added late in the boil or at flame out. These amazing Cryo Hops are available in Ekuanot, Simcoe, Mosaic, Cascade and Citra! Coupon Description: This MoreBeer.com promo code will save you $7 on their stainless steel whirlpooling arm home brewing kit. This is the same whirlpool arm that I use in my brew kettle and it works like a charm. So if you want clearer wort, a quicker chilling times, or even higher hop utilization, a whirlpool arm might be just what you are looking for. This whirlpool arm allows you to pump your wort from your ball valve, into this piece, which will jet around the inside of the kettle forming a strong whirlpool inside your homebrewing boil kettle. It will settle Trub in the center of your kettle, making it easy to pull clear wort and also gives a much higher chilling efficiency when using an immersion chiller, due to the increased turbulation of wort. 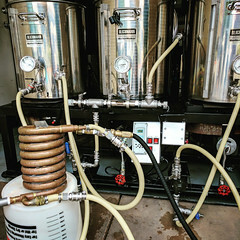 Coupon Description: More beer has a promo code activated that will save you 10% on some of their best wort aeration and oxygenation products. So of these products include pump based wort aeration systems, stainless steel wort oxygenation wands for oxygen tanks, stainless steel home brewing diffusion stones and even their high end professional grade oxygenation assembly! 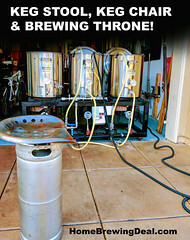 Click the following link for all of the details on this more beer promo code and remember to enter the promo code AIR10 at check out to take advantage of this great home brewing deal. Many of these items also qualify for free shipping! Coupon Description: This MoreBeer Coupon Code will get you a brand spanking new MK2 Magnetic home brewing pump for just $59! That is about the best price out there for a food grade home brewing pump, and did I mention that it ships free! Make sure that you enter the More Beer promo code BEERDEAL at check out to take advantage of this offer and be aware that they are only offering a few at this price so act fast if you want one! The MK2 magnetic home brewing pump is an incredible home brewing pump at an even more incredible price! 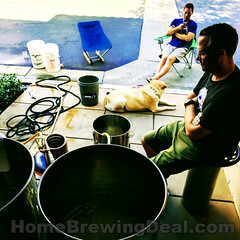 It is a great pick for just about any home brew system. 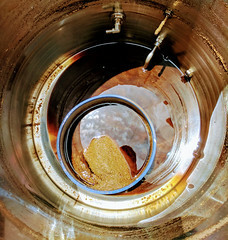 It is highly versatile and can be used to move hot wort in an all-grain system and also to transfer wort from boil kettle to fermenter or water from your hot liquor tank. The housing of the unit is made from tough and food grade polysulfone and the magnetic drive allows you to slow down the flow without damaging the pump! An optional stainless head, PMP501, can also be purchased. Coupon Description: Right now at Love 2 Brew, you can save 10% off of all of their home brewing cleaning products! This includes cleaning products such as scrub brushes, sanitizers and standard home brewing cleaning chemicals. To take advantage of this Love2Brew promo code, please make sure that you enter coupon code CLEAN at checkout. For a full list of the products that are offer on this Love2Brew.com promo code click the following link. Williams Brewing Promo Code, Save $10 On 5 Gallon Oak Home Brewing Barrels! Save $10 On 5 Gallon Oak Home Brewing Barrels! Coupon Description: These 5 gallon used whiskey oak barrels do not come available often, but you can pick one up today and for an incredible deal! Right now at Williams Brewing you will save $10 on each barrel that you order while supplies last! So if you have ever wanted to make a true whiskey barrel stout, or an oak aged homebrew barleywine this is your chance! WillaimsBrewing.com now has these 5 gallon American Oak, fresh drained whiskey barrels from in stock from a leading craft whiskey distillery. These 5 gallon oak home brewing barrels will impart your homebrew with a deep whisky oak flavor and are perfect for aging your strong ales! These are once used barrels which have stored craft whiskey for at least 1 year before being drained. Best of all, they even include a new wood stands so your barrel wont roll around your garage! More Beer’s Ultimate Sparge Arm, On Sale Now! Stainless tube measures 18.5″ from the top to the bend, and 8.5″ from the bottom to the center of the distribution disc. 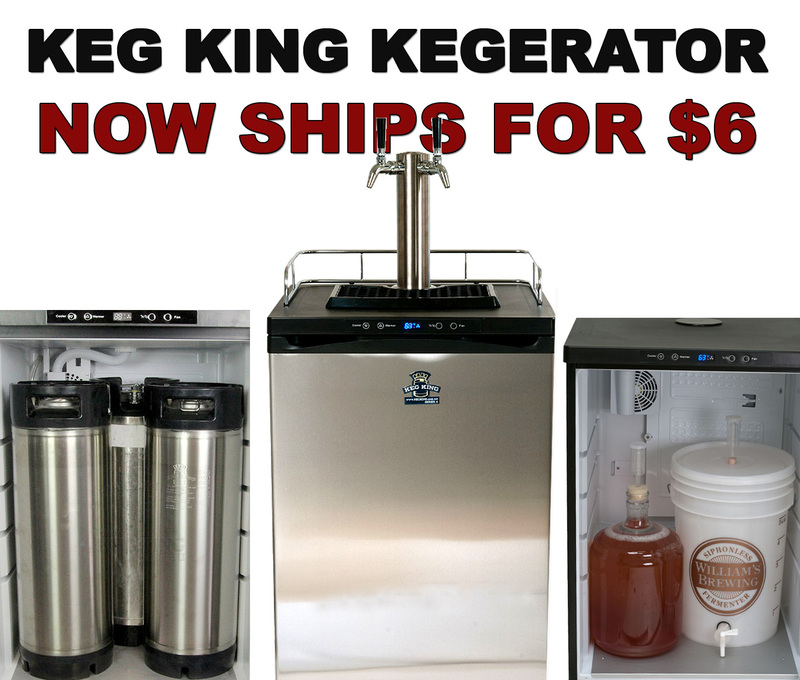 Coupon Description: The Keg King Mark 4 is the first Kegerator designed specifically for homebrewers! The Keg King Series 4 Kegerators are the only kegerators designed specifically for home brewing applications and that is what makes them them so great! They feature Intertap solid stainless forward seal faucets and even a tower cooling fan. They also have a front panel on and off switch, an interior glass holder to keep your glasses clean and cold! The kegerator comes built in with a wide range thermostat adjustable from 26° to 82° F. With all of these features you would think it would cost a small fortune, but they are surprisingly affordable, especially when considering that they come with Intertap forward seal faucets standard that are mounted on a brushed 304 stainless tower. Best of all, these Kegerators Ships for only $6.99! Keg King thought of everything with this new Mark 4 Kegerator; the Keg King Series 4 is the only kegerator to include a tower cooling fan as standard equipment, and also feature a fan on/off switch on the front digital control panel making for the perfect pour, every time. This kegerator is incredibly spacious for such a compact design, in fact, the glass holder can be removed to fit 3 kegs! Unlike kegerators with standard 30° to 50° temperature ranges, the Mark 4 can be adjusted easily with the front panel digital display from 25° to 82° F, which means you can also use your kegerator as a fermentation chamber for ales or lagers any time of the year!